Salespeople are fueled by competitive spirit, whether they’re in competition with their peers trying to win a spiff or with themselves trying to beat last year’s number. They’re even compensated based on their wins! 2. They need to spend as much time selling as possible. Organizations’ revenue comes from their sales teams. It’s the revenue that drives cash flow and provides for all the expenses in the business. Salespeople need to spend as much time in the field, at their desk, or in client meetings selling to keep the revenue coming in. For this reason, training length is always a big concern for sales leaders. Effective ones see the value in adding skills so the salespeople will sell more in the future, but these leaders have to strike a balance with the need to sell now. Business simulations are great for sales teams because they take a long period of time (like 2 or 3 years) and condense it into a few hours. 3. Their products and services impact their customer’s business. You can’t search the internet for sales training without learning that selling has changed in the last decade or so. No longer does the smooth-talking extrovert perform the best. Now, it’s the salespeople who teach, tailor, and take control of the sales process who are outperforming the others. Business acumen simulations build understanding about business in general, so the salesperson can analyze each customer’s industry and business. Equipped with this knowledge, the salesperson is able to enter conversations and confidently educate her prospect on the product’s ROI and how it will help the prospect organization increase revenue, decrease expenses, or manage assets more effectively. 4. Salespeople make decisions that impact their own company’s financials. Salespeople are responsible for sales. When driving for the top line, a salesperson may not take into account the effects of discounting, rush shipments, inventory levels, payment terms, project timelines, etc., on the bottom line. Building the business acumen of the sales team means they will see the impact of these types of decisions on the bottom line of their business. 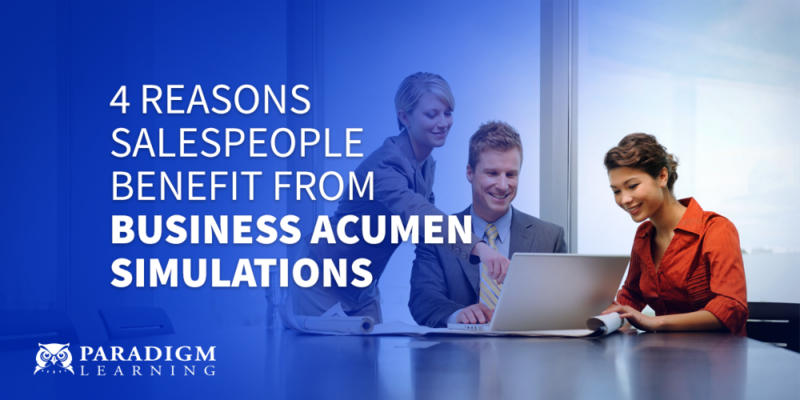 Read our eGuide, Navigating the Waters with Business Acumen, to see how understanding your customers' business and the financial impact your decisions can make you a better salesperson.